Zedd is one of the hit-makers of the modern electronic era but also a go-to producer for today’s top pop stars. The Russian-German musician is a classically-trained Grammy-winning artist who scored the Best Dance Recording trophy in 2014 for his ubiquitous single “Clarity” which features UK singer Foxes, defeating the likes of Duke Dumont, Calvin Harris, Kaskade and Armin Van Buuren. Born Anton Zaslavski, Zedd could also be credited for breaking pop singer Matthew Koma, featured on his early single “Spectrum” as well as inspiring some pop elements into Hayley Williams’ band Paramore (she is featured solo on his wildly popular “Stay The Night,”) not to mention a co-writer and co-producer with Max Martin on Ariana Grande’s smash “Break Free.” Zedd’s rising status went to the skyscrapers, literally on the May release day of “True Colors,” lighting up the Empire State Building in red and celebrating with devoted fans at the 86th floor observatory. It was a finale of sorts for the True Colors Experience tour around the country with Zedd playing intimate color-themed parties – orange at Southern California’s Joshua Tree National Park, teal at the Grand Canyon, black at Alcatraz Island and more. On the airwaves, the electronic mastermind has current hits such as “Beautiful Now” featuring newcomer Jon Bellion and “I Want You To Know” featuring pop starlet (Zedd’s former flame) Selena Gomez. New York City Monthly caught up with Zedd prior to the North American leg of the “True Colors Tour” about his upcoming first-ever Madison Square Garden show (October 2), why he prefers spinning an arena over nightclubs and he talked about the visuals that inspired his current global outing. New York City Monthly: In late August you kick off your North American tour dates. New York nightlife has changed a lot over the past several years. Music festivals have also become bigger and bigger. What is it like playing in New York vs. other nightlife capitals of the U.S.? Zedd: I have always loved playing New York, I believe it was one of my first or 2nd shows in America. I played Pacha and Webster Hall and bigger shows like Pier 84 and Electric Zoo and a bunch of others. The crowd has always been great and New York is one of my biggest fan bases. I wanted to do something really special but Madison Square Garden is something so legendary and it’s always been on my list of things I want to do one day. NYCM: You are playing Madison Square Garden (with Madeon, AlunaGeorge, Alex Metric), a place only a handful of electronic acts have played in the past few years: Swedish House Mafia, Skrillex, and Diplo, Eric Prydz, Armin van Buuren, Bassnectar. What’s it like to be among this company and get your shot at this iconic venue? Zedd: Yeah, I mean every single artist is absolutely legendary as well and I’m inspired by them. It’s an honor to play in that venue. I’ve never been there but I’ve seen pictures and videos and it looks incredible. NYCM: Can you talk about the lighting of the Empire State Building and what this multi-color experience was like for you? Zedd: It was one of the most emotional moments of this entire campaign, I have attended all the “True Colors” events. We played all the songs for all the fans. There were people at 9 out of 10 events and I asked how it felt for him, in the desert, at Alcatraz, [with their stories] I was suddenly back there. I have a lot of emotions when I hear those songs, how I wrote them, where I was. When we lit up the Empire State Building we could see outside the windows because it was kind of foggy – we could see the color reflect and I think everyone was really blown away by that. The live performance was a little surprise for my fans. No backing track, just a couple people, a couple instruments. NYCM: Can you talk about what makes this tour different than previous outings? You teamed up with artist Beeple (real name Michael Winkelmann) to create 4,000 visuals with lots of shapes and geometry. What can you tell us about this artist and the visual experience of the show coming to MSG? Zedd: Beeple is basically a visual artist from Wisconsin, he’s always made some of the best visual clips in the world and put them up online for everyone to download. He does it because he likes to do it. We got in touch with him about two years ago and I said I’m a huge fan of everything you do, and I said how about some customized visuals. He said he wasn’t interested and we were talking forever and then he saw a show and he knows I’m very focused on having the visuals very unique. We approached him and said we’re playing this gigantic tour, we can base the whole tour on all of your visuals. We needed half a year of his time and he agreed. We rendered all the visuals in insanely high quality and basically built the production around those visuals. It’s going to look insane. The main idea is to make the shapes in this world with a different color, and with that color you will feel like you’re in a 3-D world. NYCM: This town’s got huge stadiums and arenas and many clubs. 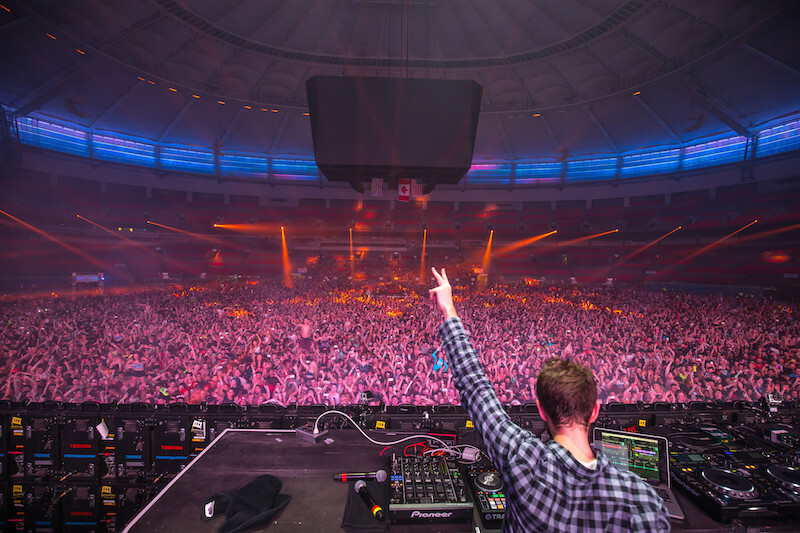 What is more exciting to you, playing in a nightclub setting or a big arena or festival? Zedd: I personally prefer the big arena setting. Because I spend so much time on the production, and we watch the shows after and take notes. I want to do everything live, there will be no time code. When people see my show it’s not pre-programmed. It takes a lot of time. When you play nightclubs you have to work with what people give you and sometimes it’s not my artistic dream. My concept of a show includes the music but also includes the visual aspects and it comes together in one emotion. I can’t achieve that in nightclubs, which doesn’t mean I don’t hate playing them. I’m of the opinion that a DJ should plan their set as much as they can, and to let the team know what visuals to prepare. NYCM: Your Best Dance Recording Grammy for “Clarity” was up against incredible talent and songs that year. What was that moment like for you to get this accolade from your industry peers? Zedd: It was one of the most amazing moments of my life. My parents and brother [Arkadi Zaslavski] were there. I remember going a couple years ago when he was nominated for a Grammy and we felt like we all won. The year I was nominated he came with me and all our friends were there. I always consider if I’m happy with something and I think it’s good, as a musician, then that’s more for me than a review about my record. I have spent a lot more time with the music than they have. You would need a couple weeks to know what’s going on. For me the confirmation was completing my record. Winning the Grammy though was also a sign that people all around the globe will sooner or later know about it. NYCM: Zedd, “True Colors” is your 2nd album and you once again collaborate with many big stars and other relatively unknown singers, from Hayley Williams to Selena Gomez to Jon Bellion and Troye Sivan. I’m also impressed with the collaboration with X Ambassadors and Logic (“Transmission.”) Also, I know “Break Free” is Ariana Grande’s album track, but your production on that was flawless, love that song. Zedd: I was saying, I think the vocal of a song is a lot more important than people realize. sometimes people should think more of who is going to sing the song. The vocal color and the way they sing the words can absolutely make or break the song. Some songs have two or five or six vocalists. Even though they sing the same words and melody, the way you perceive it ultimately comes down to is it believable or is it not believable? It’s a feeling thing, and it’s about people feeling it. I almost didn’t put “Clarity” on the album but with Foxes it was believable and real. NYCM: “I Want You To Know” is shimmering aggressive dance-pop anthem and “Beautiful Now” has some folk elements – both seem to have done quite well for you on the dance charts and also crossing over to pop formats. It’s clear how you know Selena but how did you find Jon Bellion? Zedd: I just loved his voice. I heard his voice and I reached out to him and said I would love to work with you. I wanted to see how his voice fit on the song. He recorded a little demo but didn’t love how he sang certain words. We recorded together exactly how we wanted it. NYCM: Classical music is a big influence for you and I know you learned to play the piano at 4 – really the complete opposite in many ways from electronic music – the tempos, instrumentation, lack of lyrics, and song structure. But one could argue there are similarities, from the storytelling to the intensity of the arrangements to the varied sounds that you can achieve in one piece. Zedd: I think it very much depends on what kind of music you — a random example “Firepower,” I think there’s a lot of very classical elements to that song. There’s a lot of techno music where there’s 30 minutes where the beat doesn’t change a whole lot. It’s based on a bass or sub-range, I think that has very little to do with classical music. I think it depends – Addicted to Memory, the end is very classical, written as a classical piano part, but then I found the right sound for it. Musically speaking if you wrote it on paper it could be very classical, all depends.